Dear God say it's so! Just found this via Curbed. It won't be the exact same...but, it will be close enough to make my head twirl in joy! I just cannot imagine what took them so long! When every time Domino's name is mentioned there is a tear shed by every design lover in America. If there is to be anything right in 2012, this would be it. Come on big money! That would literally be the greatest news I ever heard! I don't really understand why they stopped? We are doing a great GIVEAWAY!! Please visit us to learn how to enter to win a TASSIMO ESPRESSO MACHINE lifeSTYLE Giveaway! Pleeeezzz...say it so! Best news today! If this does happen, I will be absolutely over the moon!! 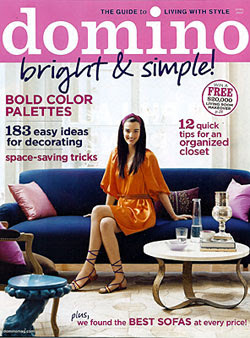 Domino was my alltime favourite magazine (the also now-defunct Blueprint a second) home decor or otherwise and to have it resurrected would be amazing. Even if not, I'd still be excited to see what actually comes out. There are never enough home decor magazines out there! Fo reals???? Please, please say it's so!!! OMG please lord let this be true!!! Say it's so! I would be sooooo happy! I kept every issue & refer often! Please! I hope it's true! Whaattt???? Is it true?!!! I just finished looking through my Domino Book of Decorating and I was thinking how nice it would be to have the magazine back. Let's hope!!! Oh, I know what you mean. I just loved Domino. I want it back so badly. Fingers crossed for something really good!